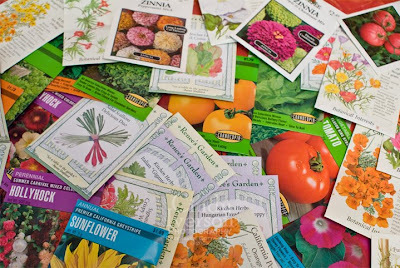 Yesterday at church as I was sitting down for Sunday School, my friend Kathy casually mentioned that I should come over some time this week because she just got a big shipment of seed packets. As a horticultural instructor at our local college, distributors often send Kathy the seeds and bulbs that get pulled from shelves at the end of the season. The bulk of the seeds will be used for her classes, but she wanted me to look through the boxes to see if I wanted any since there were so many. Over our 8 year friendship, Kathy's generosity has beautified not only our garden, but the garden across the street as well as all the others at church that are recipients of her plants, seeds, and bulbs. Kathy is literally helping to make the world a more beautiful place. This morning, I headed over to Kathy's. We stood in her garage as I sorted through large boxes of seed packets--some sorted and some not. I had to keep telling myself to be highly selective. You know the old adage "Your eyes are bigger than your stomach."? Well, my eyes are often bigger than my garden. 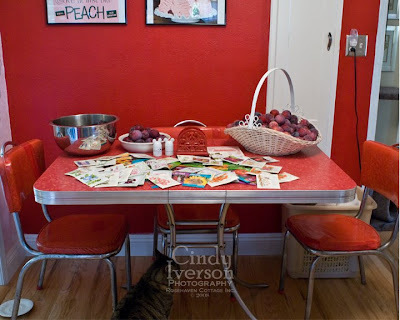 We talked while I flipped through packets--garden talk... what else? 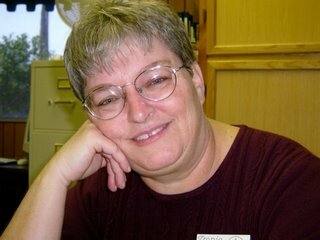 It's always a pleasure to talk with Kathy because not only is she incredibly knowledgeable about our micro-climate (one to which I am relatively new having only been here 8 years), but she is a kindred spirit. Kindred spirits in conversation or in silence are contented and happy indeed. After I selected all the seeds I wanted (I still managed to take enough to cover my kitchen table), Kathy wanted to show me her current tomato crop and how well it's doing this year. We walked around to the vegetable beds and talked some more until it was time that I headed out, leaving Kathy to get on with her busy day. Somewhere on the way back out to my truck parked in the driveway, Kathy casually mentioned something like, "You wouldn't happen to want a brugmansia?" Sometime last year I was bewitched by all the photos of brugmansia that I had seen on other garden blogs. I really wanted one. I even wrote "Angel's Trumpets--Brugmansia" on a sticky note and put it on my "idea board" behind my computer. It was officially the only plant on my "fantasy wish list"--the list reserved for things that I really want but shouldn't get unless I really have the budget for it. Besides needing to funnel budget toward other purchases such as the citrus trees that I'll be putting in over the next couple of months, I hadn't really seen any brugmansia at the nurseries--at least any I liked the looks of enough to justify spending the money. So the brugmansia stayed on my "fantasy wish list" of one plant. I don't know what the look on my face must have been when Kathy asked if I happened to want a brugmansia, but I'm certain my giddiness was evident. As we walked back the way we'd came, she asked if I'd like one that's a 2-tone whose blossoms fade from a pale white-yellow to a pale peach. Sure! We reached the area where she had the 5-gallon potted brugmansia plants that she's grown from seedlings for the past two years. She picked one up that was over my head. That was the one?!?! And, she informed me, that since it was already 2 years old I wouldn't have to wait for it to bloom. In fact, it already had buds on it ready to open! I'm fairly certain I was dizzy with giddiness as we loaded it into the truck, and Kathy secured it with my bungee cords. I drove the short distance home so carefully. I didn't want anything to blow those buds off. I got it home intact and happy. I knew where it was going to go. In this climate, Kathy told me that brugmansia need afternoon shade. It would go in my afternoon-shade area across the path from the olive tree. That would be the perfect spot! Right away, I dug half a hole and then built up a planter with chunks of recycled concrete left over from the demolished shed pad. Then, in went the brugmansia and some bagged top soil. I watered it in, and it already looks so happy there. This plant, like all the wonderful growing gifts residing in my garden, will be a constant tangible reminder of true friendship. For me, it is inspiring to know that in this calloused world, there are still precious experiences and relationships made up of things such as seed packets and brugmansia. 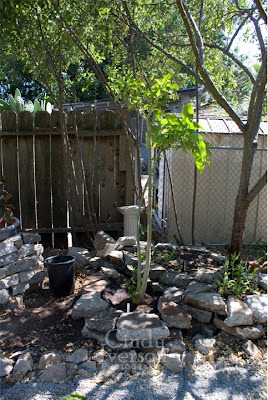 Left: The brugmansia this afternoon before it was planted. 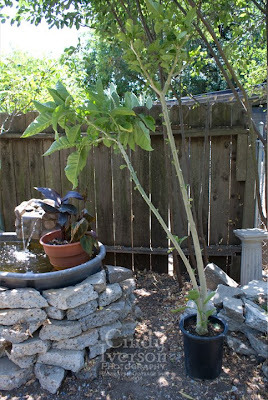 Right: The brugmansia planted in its new raised planter. A very generous friend indeed! It must have felt like Christmas:). I don't know how good I am at gardening...I did great my first year here, but have had a little drama since then. But no matter what, I have the bug of selecting, planting, and nurturing little green things. As I said, my flower garden is a bit abismal, but the veggies my roommates planted (and I kept alive by watering their first 3 weeks of life) are doing amazing. I'll have to post a few things after I get back. Isn't it fun though?! What a gift! I hope you enjoy your brugmansia. I've never heard of it before...but now I know the name. So I guess I've learned something today. How lovely! can't wait to see the flowers and hear your happiness at it. Some plants are so special just for having to be waited for. What a happy gift. I'm so glad you have sweet friends there in your little neck of the woods. I love to watch the changes in your garden. I love that you can name all the plants she's shared with you. Kathy has a good knowledge about plantation. I agree very generous friend . I love your garden pics. Gardening is the only thing I miss about not having a house. If I ever stop living in an RV and get another house, I will be planting an herb garden before I put my belongings away.